I have been thinking for some time “I must write my blog, I must write my blog, I WANT to write my blog!” And so, last Thursday, at long, long last, I sat down to do just that. And you know what? NOT. A. THING. N O T H I N G.
I started writing a few different pieces, dragging the words out of myself and then deleting them all. My mind was blank. I literally had nothing to say. I am not the greatest of thinkers or orators at the best of times – this I know – and yet, and YET..! The emptiness and loneliness I felt in that moment was really painful. Since we returned from Canada at the start of December last year, my mind has been in varying states of turmoil. In many ways, I’d say (and have done, numerous times) that almost every aspect of our lives is in question. Where are we going to live? How are we going to earn money? How are we going to continue educating our children? How do we fit into the world? Where is our place? Lately, I’ve been experiencing a fine line between non-attachment, in the Buddhist sense – essentially practicing release from desire and therefore suffering – and disconnection. Because that is what I have been feeling since our return – disconnected. From everything, and (almost) everyone, myself included. What I have come to realise is this: people like to have answers for things! Where ARE you going to live? How ARE you going to earn money? Etc.. And when I can’t answer these questions, not only can it make the person I’m talking to feel really uncomfortable (does it make them call into question their own life choices? ), it can also throw me into a state of uncertainty and anxiety. I can go from experiencing the openness in our lives as liberating, full of potential, exciting even, to being full of worries and concerns about all those limitless unknowns. And so I feel myself detaching and going into myself more. As if I were curling in and around my invisible core, to keep it protected somehow. Be patient toward all that is unsolved in your heart and try to love the questions themselves like locked rooms and like books that are written in a very foreign tongue. Do not now seek the answers, which cannot be given you because you would not be able to live them. And the point is, to live everything. Live the questions now. Perhaps you will find them gradually, without noticing it, and live along some distant day into the answer. These words came to me like a soothing balm, at a time when I was feeling particularly small, particularly vulnerable and particularly voiceless. I was surprising even myself with the level of aloneness that I could experience, surrounded as I was by strong, safe, solid, open, loving and generous hearts. These words allowed me, too, to open my own aching heart. To pour forth what I have been keeping from view for so long. To ride the waves of shame and fear that threatened to swallow me up, to raise my head and speak directly from my heart into the hearts of others there, waiting patiently and with compassion to witness me and my story. This is profound work. And it is painful. 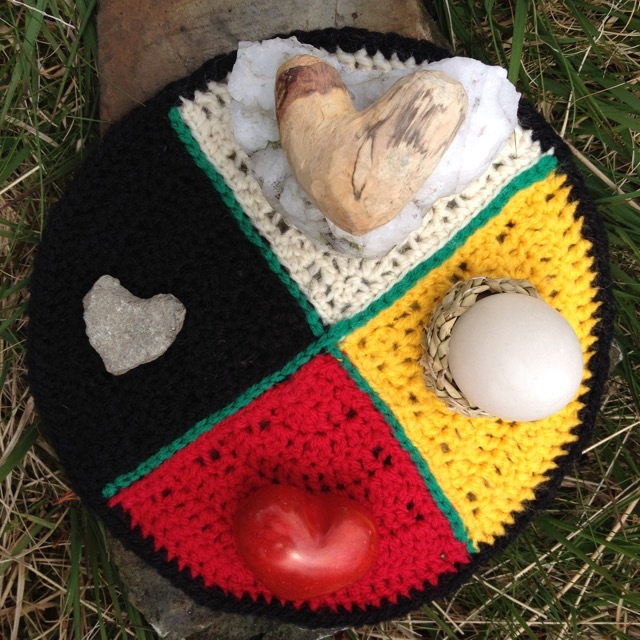 And, I know I will go back time and again into these sacred circles to open myself up – not only because I know of the deep healing that resides in this space, but also because I know this is where I remember how to connect. With myself, yes of course; also, crucially, with others, and with Spirit too. Way of Council is often described as a place where people find ‘home’. I know what that means, without really being able to explain it. It is like a resting place, where soul can settle, and spirit can breathe out. A place to come back to in those moments of darkness that always return, knocking us off our feet and taking away our breath. In our circle, I heard myself speak and I witnessed myself being heard. And I was welcome. It brought home to me that when we really, truly, deeply, honestly, openly speak from our hearts, and we really, truly, deeply, honestly, openly hear from our hearts, profound things happen. We are all capable of this. All we need to do is listen. Our voice is always there, and we always have something to say.